Day 316: Demonetization- who is bearing the pain? November 8, 2016 will be set as a phenomenal date in the history of the world. Too many things changed everywhere and sometimes these turning points will lead humanity to a new horizon. Ah, but don't ask me if it is for the best or the worst. In the United States, a businessman trumped the world by becoming the president elect of United States of America. While this was making waves all around the world and most countries especially India's national media had all their eyes and ears on to happenings here in the US, the Prime Minister decided to play a master stroke and took all by surprise. He decided to bring in a new 'change'- demonetization of two of the largest denominations of Indian currency. Rs. 500 and Rs. 1000 was nullified and that is almost 86% of Indian currency. So, those who saved these notes in their piggy banks or inside their wallets or inside secret stashes at home had to find ways to get that changed. Most of India tries to keep cash in hand for emergencies and cards are more popular with the younger generation or urban folks. Initially this move was proposed as a means to curb black money and all those who had these money had only one place where they could use it- the banks. However, the banks did not have enough cash in hand to give back to those who came to withdraw and from then on there is no dearth to the serpentine queues in front of banks and ATMs. It is not that this kind of move has never happened before. This did happen earlier for the very same motive- helping curb black money or hawala. In 1978 and 1946 when this happened they only voided the largest currency which was Rs. 10,000., Rs. 5000., and Rs. 1000. This time again the two of the highest removed are 500 and 1000. However, had this remained that way with only an introduction of 500 and lower denominations it would have been a better deal. Instead the government decided to introduce a Rs. 2000 note. The catch was that there was a limit on how much people could withdraw from the ATM, the bank per day, per week and so on. This topic also took a U turn when the Prime Minister announced that he plans for India to go cashless and use digital money. Well, we don't know what he actually intended this move to do but he sure has no clue about how he has executed the plan. As of today, it is only the upper middle class folks who are moving through this chaos without much issue but the common man like a farmer, daily wage laborer and so on are struggling to keep his/her life together. As for the black money it is safe in some Swiss bank! Here is my two cents worth on this topic. As much as I think the move was essential and probably might help a few (read A FEW) of the hoarders which is a part of the collateral damage, it is hard to even fathom the amount of printing new currency that will take to help settle this issue for the common man. Again I am all for introduction of digital and cashless transactions. This will surely tighten certain loopholes in businesses but the problem is that there is no infrastructure that will support the rural towns and cities. Even tier-II towns and cities have no infrastructure to support such a large project. Good intentions are always not that great enough ideas. Even if one's intention is good a better planning and execution is required for projects or changes of this scale. Perhaps this change issue will help in a long term plan of digital money in India but how much will change and how effective it will be can be answered only with time. 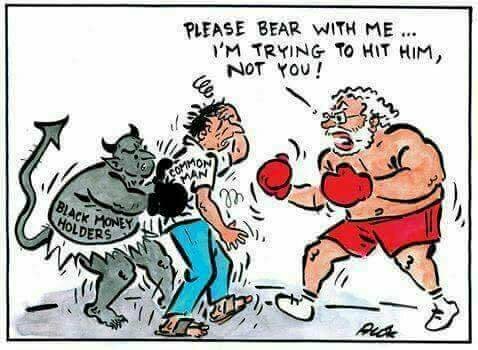 Meanwhile the 'demon' in demonetization is playing games in the lives of a common man who is trying to save for his future and surely not having any ties to the Swiss banks.